They did not appear to contain a chest of any kind, although, in the second one, I mined the mossy stone blocks and one of them threw up wooden chips and made the sound of wood being broken/chopped (please see attached pictures). At first, I assumed that this was yet another bug, but, when the block was finally mined, a chest appeared, which suggests to me that one of the blocks (at floor level, as in, in the floor, not on it), was an empty chest despite looking like a mossy stone block. MCPE-10612 Blaze spawners just don't work. 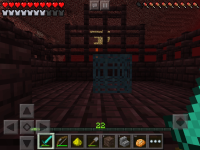 MCPE-10711 Empty spawners emit fire particles after update!